Located in southern Oregon and a days drive from Portland, Oregon or Boise, Idaho, Crater Lake National Park is the only national park in Oregon. Crater Lake is all that is left of the destroyed volcano Mount Mazama, and Crater Lake National Park is situated on its caldera. Crater Lake has no rivers or streams flowing in or out of it; all of its water is gained by precipitation, and some are lost by evaporation. The park hosts a landscape painted in deep green coniferous forests, jewel-blue lakes, rivers, and streams. Follow the park’s most popular road, Rim Drive, for the road trip of a lifetime around the caldera rim. Car travel too modern for you? Take a day hike or extended backpacking trip along one of the popular trails including the Pacific Crest Trail which connects Canada to the north and Mexico to the south. Hiking a portion of the Pacific Crest Trail is quite the experience, and you’re sure to meet a person or two hiking in its entirety. 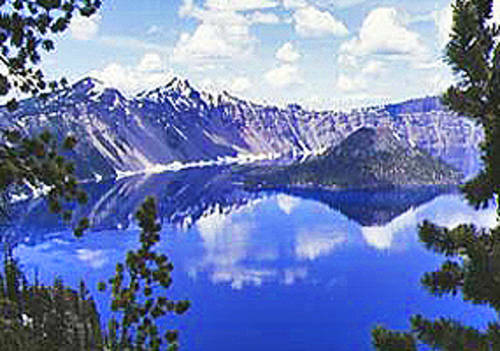 Take a summer boat tour to Wizard Island in the center of Crater Lake, or go for a swim. Crater Lake National Park has many road closures during the winter, so plan your trip accordingly and call the park rangers station. Crater Lake Lodge was opened in 1915 with a total of 71 rooms. In 1995 Crater Lake Lodge was completely renovated all the rooms and property but kept the rustic charm of the hotels 1920s. The Running Y Ranch is a full-service lodging resort located in Klamath Falls Oregon about 59 miles from Crater Lake National Park. The Running Y Ranch is an all-season resort and recreational paradise!